Between the members of Earlyworks, we are able to dress and equip ourselves as individuals from a range of historical periods, Bronze and Iron Ages, 2nd, 3rd and 4th century Roman, Saxon and Viking. Our particular strengths lay with the 4th century Roman period where we re-create legionaries from the Invicti Iuniores Britanniciani. Click on the accompanying photographs to find out about our Earlyworks projects, or use the drop down menu. Perhaps of all the periods of British history, the Mesolithic is the most entrancing, and also the most enigmatic. But it is also relatively unknown to the layman, who may recognise the mammoth hunters of the Ice Age, and the technological wizardry of the early Stonehenge builders, but not realise that there is a vast gulf of human prehistory that separates them, something like four thousand years, the equivalent of 160 human generations. Of the entire human occupation in the British Isles, from the time the glaciers of the Ice Age retreated up until today, the Mesolithic takes up an extraordinary two-fifths. Before cities, before common metalwork, in an age where power resided with men who controlled the international trade routes, bronze was the metal of choice, the first truly useful metal. 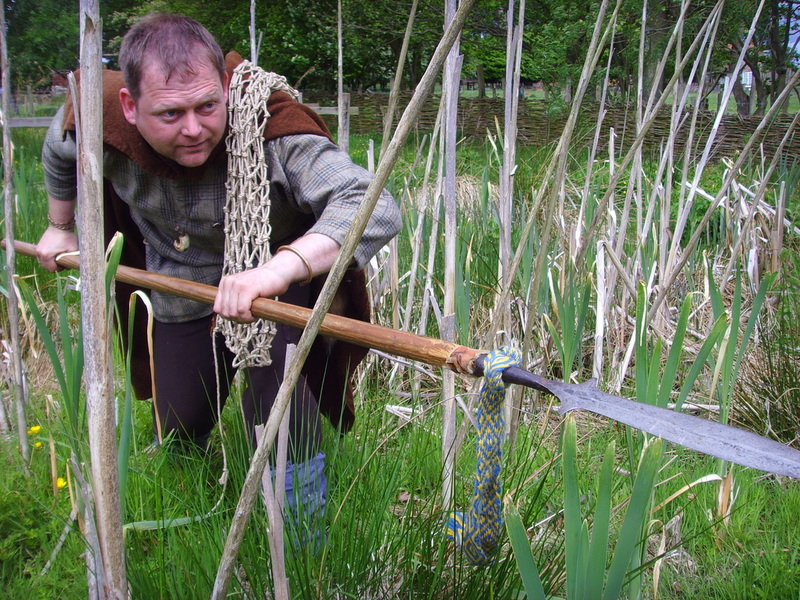 Across Britain communities were clearing land with bronze axes to create field systems that can still be traced today. Of course the Bronze Age is famous for its communal monuments, standing stones, henges, stone circles, chambered tombs and the enigmatic cursus. Paul Elliott has collected daily artifacts used in the Bronze Age, but likes to specialise in that particular period known to all as 'the Age of Stonehenge'. As the population of Britain expanded, communities came into more conflict, prestige and inter-tribal conflict became important. Local chieftains now had a shot at the big time because iron now replaced bronze, and iron was found almost everywhere! Tribes formed, created identities and built elaborate hillforts and other defended enclosures. As in the Bronze Age, the population continued to live with their uniquely British round-houses. This culture found itself enthralled by Roman wines, pottery and wealth, but soon came face to face with the Romans when Caesar arrived on a glory-hunting expedition in 55 BC. The British tribes either came to an accommodation with the Roman army that arrived in Kent in 43 AD, or decided to fight. For most of Britain the new Roman regime, imposed by force, became the new way of doing things. Everyone from shepherds to nobles, potters to farmers adopted Roman clothing, speech, manners, diet and beliefs in order to fit in and play the game. Rebellions were crushed. The Romans built the first cities, roads, postal system, stone bridges and urban infrastructure. In 122 AD emperor Hadrian had the wall built across Britain that bears his name. It served as a vast military fortress from which raids could be carried out on those tribes still wishing to fight the Roman occupation. The 4th century saw a flowering of Roman culture in the British isles, with grand villas being completed and many featuring beautiful mosaic pavements. However, the province of Britannia flourished only with military protection from the legions. When they were required elsewhere to protect Rome from the attacks of Goths, the money went with them. The economy took a hit, many services, craftsmen and traders realized their market had gone. Raiders, mercenaries and invaders took advantage to move in. The legionary soldiers who marched out of Britain around 401 AD looked very different from those who had arrived 350 years earlier. Earlyworks members recreate the kit and shield design of a British regiment fighting in Spain against the Goths: the Invicti Iuniores Britanniaci. With the legions gone, and power now localised with tribal chiefs, leading city magistrates or warlords, Britain was ripe for exploitation by Saxon mercenaries offering their services to one faction or another, and bringing in their warbands and families with them. Britain seemed at the mercy of these violent freebooters, taking what they wanted and sometimes clashing with one another. Gradually the dominant culture shifted toward that of the incoming Angles, Saxons and Jutes. Perhaps many of these war leaders siezed power for themselves where they could. Elites dominate the culture, even the peasantry begin to dress like them and learn their languages. The Anglo-Saxons culture came to predominate across Britain, leaving the western British tribal lands relatively untouched. Later, new invaders, traders and colonists arrived on British shores: the Vikings.